There was a point in the thriller Grand Piano that I laughed out loud. It was a climactic moment—it probably wasn’t supposed to be funny. But it was just so ludicrous that I couldn’t help it. The movie ventured firmly into unintentional comedy, but the weird thing was, it didn’t take away from the movie, or the experience of watching it, at all. It was just acknowledgment that, yes, things had gotten a wee bit silly, but that it was still entertaining and the conclusion satisfying, after all. Grand Piano is borderline stupid but it’s so STYLISH that really, nothing else matters. 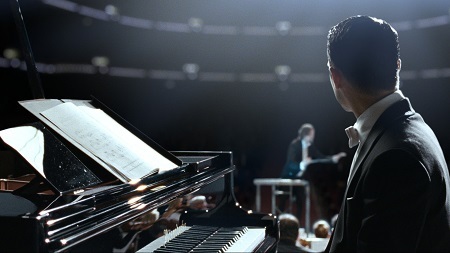 Directed by Spanish filmmaker Eugenio Mira, written by Damien Chazelle (whose directorial debut, Whiplash, was one of the biggest hits at this year’s Sundance) and starring Elijah Wood, Grand Piano is a movie that puts style over substance to great effect. It’s a movie that owes a lot to Hitchcock—who perfected the art of making flashy, captivating movies based around the stupidest plots imaginable (avian attack? REALLY? )—and everyone involved seems totally committed to not only their stupid plot but also in nailing all the details that make the movie work in spite of that inherent stupidity. The plot is so simple it’s borderline special needs. Wood stars as Tom Selznick, a brilliant concert pianist with a crippling case of stage fright. At the point that we meet him, Tom is best known for freaking out on stage during a performance of the “unplayable” La Cinquette, a piece of music made up for the film but that is supposed to be akin to Rachmaninoff’s infamous Piano Concerto No. 3. But Tom is in Chicago mounting a comeback arranged by his movie-star wife, Emma (Kerry Bishe, Argo), five years after said melt down. Then, while performing, he finds an ominous “Play every note perfectly or else I will kill you and your famous wife in front of this audience” note penned on his sheet music. The voice of John Cusack proceeds to threaten and cajole Tom to give his most brilliant performance ever lest the concert end in murder. All this happens after the conductor and Tom have a whole conversation about how Tom always flubs notes and though the audience never notices, Tom’s mentor, the famous composer who wrote La Cinquette, always did and oh yeah, Tom is performing on his eccentric dead mentor’s beloved Bosendorfer. Hitchcock coined the term “MacGuffin”, referring to the singular plot device that drives a narrative. Some of his famous MacGuffins include the murder Jimmy Stewart’s character witnesses in Rear Window, the necklace in Vertigo, or the reason for the bird attack in Birds. More recent MacGuffins include R2D2 (and the Death Star plans he contained), the Tesseract in The Avengers, or any object Indiana Jones was chasing. 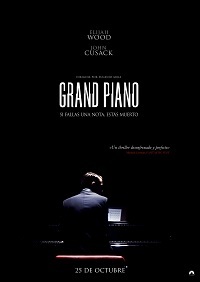 Like Hitchcock’s thrillers, Grand Piano revolves around a MacGuffin—in this case, a key locked away inside the piano. If that sounds dumb, well, it is. And like many of Hitchcock’s movies, the further characters go in pursuit of the MacGuffin, the loonier events become. But Grand Piano overcomes its inherently stupid MacGuffin by being nearly perfect in every other regard. Wood’s acting is solid—he has to carry a fair chunk of the movie alone and does so ably—but Mira’s direction is the real star. His camera moves constantly but each move is calculated to heighten some element of the story. Long tracking shots build tension, 360-degree pans create a dizzyingly frantic sense of urgency, quick cuts create dread as they simulate Tom’s nervous, darting gaze. And the music—my God, THE MUSIC. Scored by Spanish composer Victor Reyes, the music Tom plays—which sounds like totally viable classical music—is actually the score itself and it tells the story beautifully. I wish there had been no dialogue once the concert got started and we were left simply with Mira’s frenetic camera and Reyes’ superb score. 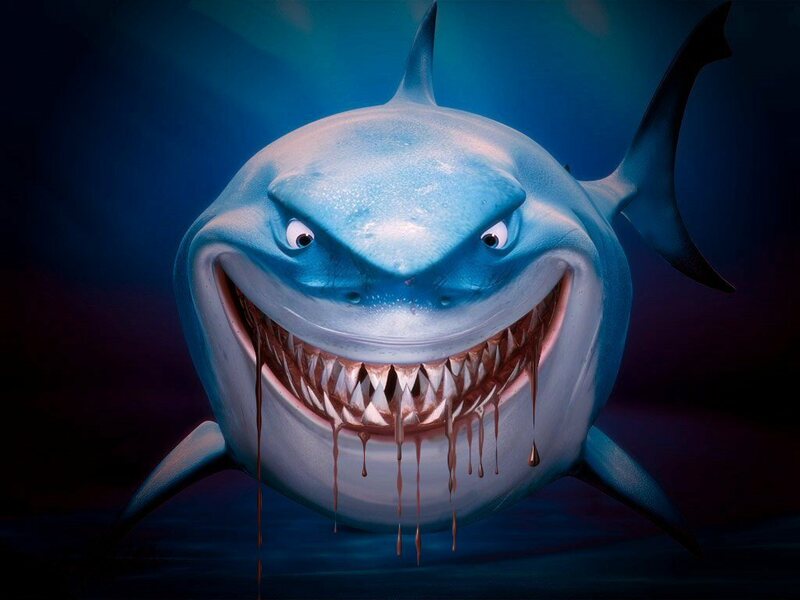 The whole movie is made of visuals like this. It’s hard to resist. Grand Piano is dumb but smart at the same time. You’ll probably laugh at the same place I did for the same reason I did, but even though the plot is thin, the movie is so well made and so perfectly conceived as an exercise in cinematic language that flaws disappear into superior visual storytelling. It relies on our ability to pick up non-verbal cues to get swept up in Tom’s dilemma—it’s dumb but never pandering. Though Grand Piano will be in theaters on a limited basis this month, at a tight eighty-two minutes, it’s perfect on-demand viewing at home. One of the most ridiculous movie I saw !